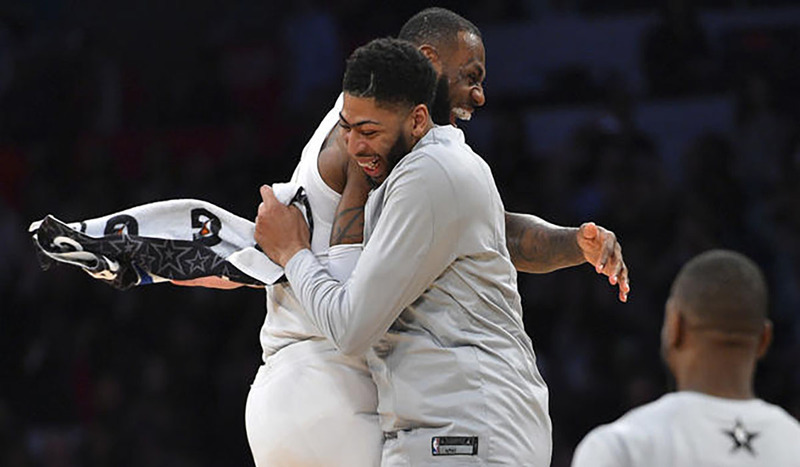 The Los Angles Lakers couldn’t get a deal done for Anthony Davis before the trade deadline. Lakers star Lebron James made up for it by drafting Davis to his All-Star squad on Thursday. Giannis had the first pic of the second round and decided to pick up his teammate Kris Middleton. James seized the opportunity to draft Anthony Davis. “Isn’t that tampering?” Antetokounmpo asked with a smile, provoking laughter from James and the “NBA on TNT” hosts who were commenting on the draft. “Tampering rules do not apply on All-Star Weekend,” James replied with a chuckle. The NBA paid tribute to a pair of legendary players, adding the Heat’s Dwyane Wade and the Mavericks’ Dirk Nowitzki as “special team roster additions” and setting up a final draft round comprising just those two. James had the first pick of that round, selected Wade, his close friend and former championship-winning Miami teammate to play in one last game together.